The Metro Rail Transit Line 3 on Friday confirmed it received a bomb threat before the deadly explosions in Jolo in late January, saying this was the reason it tightened the security checks at its train stations. “The bomb threat was sent via e-mail and received last January 3,” MRT 3 told reporters in a Viber group message. “It was already coordinated with the authorities, PNP-CIDG [Philippine National Police-Criminal Investigation and Detection Group] for them to track down the e-mail sender,” the company said. 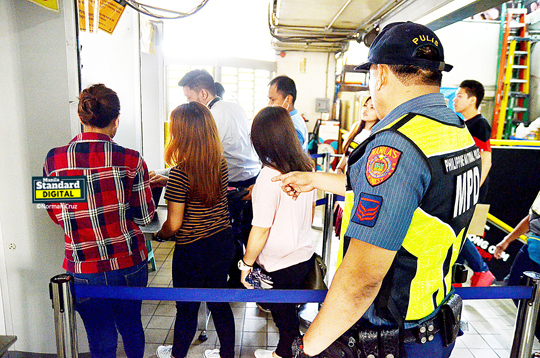 MRT 3 also said some liquid items may be allowed inside its train stations amid the implementation of the ban on liquids as part of the heightened security there. The bomb threat was among the reasons MRT 3 tightened its security, particularly the prohibition of several liquids inside the trains. “That’s one reason why we tightened security following the recent attacks in Mindanao,” MRT 3 said. MRT 3 recently earned the ire of commuters after it banned bottled drinks, water and any liquid substance as these could be mixed with other substances to form a liquid bomb. The additional security measure was recommended by the PNP after the deadly bomb attacks on the Our Lady of Mount Carmel Cathedral in Jolo that killed at least 23 people last week. Baby formula/breast milk in bottles, if the passenger is travelling with a baby or small child; Drinking water to be used by the baby or small child; All prescription and over-the-counter medications; Liquids including water, juice or liquid nutrition or gels for passenger with a disability or life condition; Life-support and life-sustaining liquids such as bone marrow, blood products, and transplant organs; Items used to augment the body and for medical and cosmetics reasons such as mastectomy products, prosthetics breast, bras or shells containing gels, saline solution, or other liquids; and gels or frozen liquids needed to cool disability or medical-related items used by persons with disabilities or medical conditions. The MRT 3 said the emailed threat was now under investigation. “We just wanted to be cautious, since we have thousands of passengers daily. We do not want to compromise the safety and security of our passengers and personnel, we will not lax and we will implement a more effective security measures in our trains and stations,” MRT 3 said.